Are you looking for a job in Buying House? This article may help you to have some idea of buying house interview question. If you want to get employed in buying house or any other multinational company, you have to face an interview. The question pattern may vary from company to company, job to job or intention of the interviewers. It will be good for you if you know the buying house interview question. I have tried to accumulate some commonly asked question by the interviewer so that you can prepare yourself mentally. For accumulating all these 26 questions, I have talked with several people who are now working in buying house and faced these types of interview before getting their jobs. In addition to this, I also used my own interview experience in getting my job. Why you changed your previous job? What is your strong side? What is your specialty in this sector? How did you hear about your position? Where you want to see yourself after 5 years? How will you handle pressure in this position? How you manage your working hour? How many years do you want to work here? Why you prefer to work in this sector? What is your aim for our company? What is your main responsibility in your current job? Note: Interviewer will not give you second chance to answer your question so be careful when you are answering. Get prepared yourself before attending our job interviews and arrange all these questions answered in your mind so that you can answer them fluently. One important thing is, listen carefully to what the interviewer is saying and after finishing, then you answer the questions. Do not interrupt when the interviewer asking your questions. Try to be positive and never say anything which can create a bad impression about you to the employers/ interviewers. 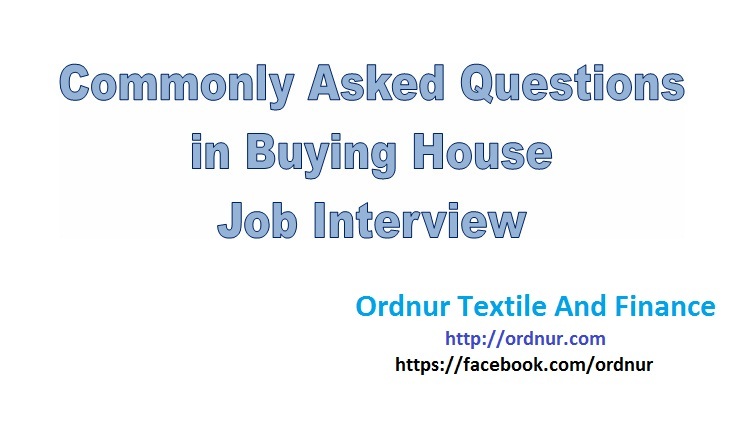 Tagged buying house interview question, Buying House Interview Questions, Common Question for Buying House Interview, Common Question of Buyinghouse Interview, Commonly Asked Buying House Interview Questions, Interview Question of Buying House, Most Common Question for Buying House Interview, Most commonly asked questions for buying house interview, Question for Buying House Interview.